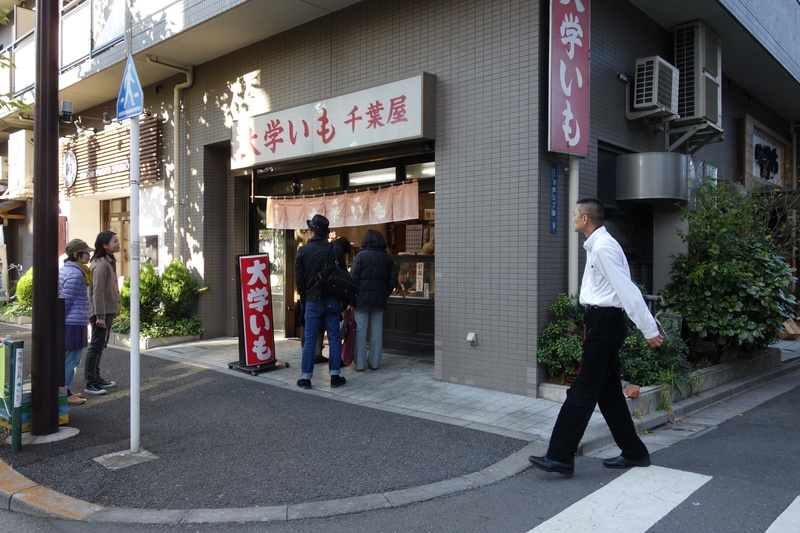 Asakusa 3-chome is where things start getting deeper, toward Senzoku and the old licensed quarters of Yoshiwara, it feels both darker and draftier than the bright temple grounds of Sensoji just south. Plenty of shuttered businesses around here, though also a couple of expensive-looking restaurants, some very late-night bars and snack establishments, and a big martial arts gym. There is also this store along Kototoi Dori, opposite Asakusa’s least-used shopping arcade, with the open-fronted counter that gives onto a gunmetal grey, steel-sheeted kitchen. 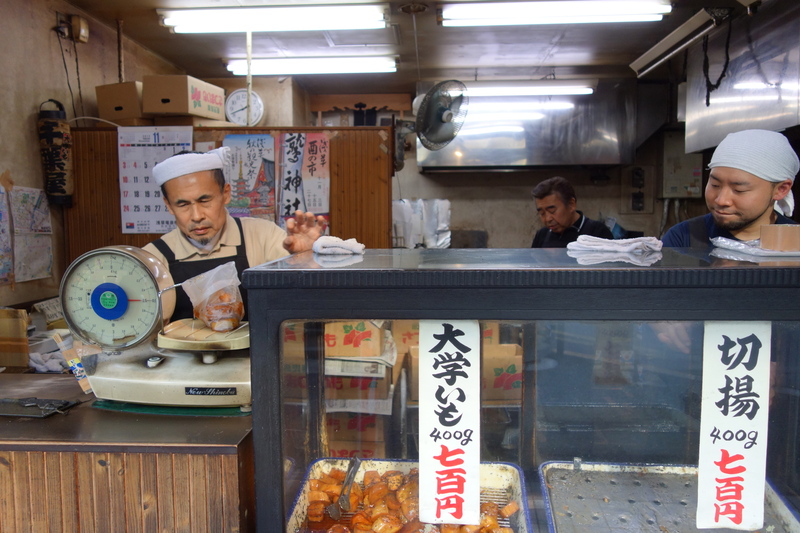 People line up here to buy the famous deep-fried daigaku imo, university potatoes. It will sustain you through the cold, this food, rich in starch and soft fiber, glistening in sugar syrup and speckled with black sesame. So named sometime mid-last century because sweet potatoes were cheap energy for students, a hit at university fairs – or, as some say, as simply a clever ploy to upgrade the image of the lowly tuber. The daigaku imo at Chiba-ya have a sophisticated flavour and texture that are hard to pass up. Just crusty enough on the outside, the coating not too sweet. They should know what they’re doing here, as daigaku imo are the only thing they sell. You walk by, and then double back, attracted by the hard-working look of the kitchen and the industry of the men, and the woman with the bicycle who has just queued, and look!, she is extending her bag of them, piping hot, to you! Go on!, she says, take one. Yes, thank you! Excellent! And then you buy your own. 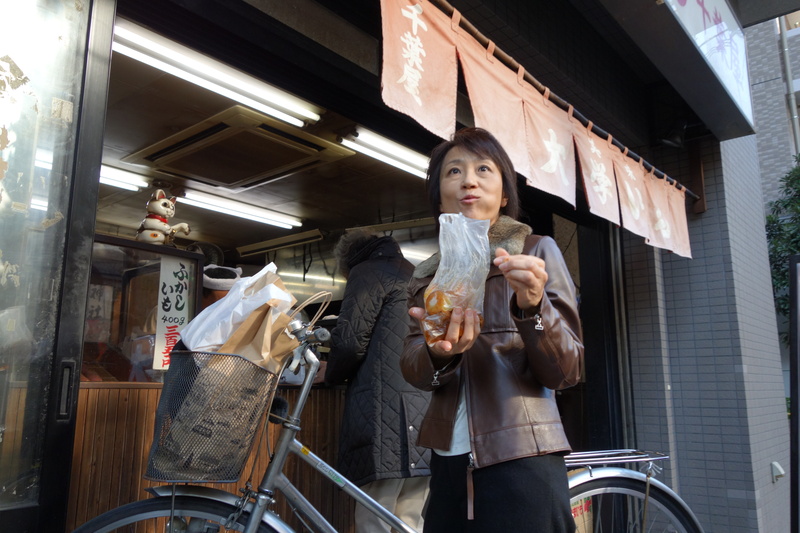 Seven-hundred yen gets a 400-gram bag. 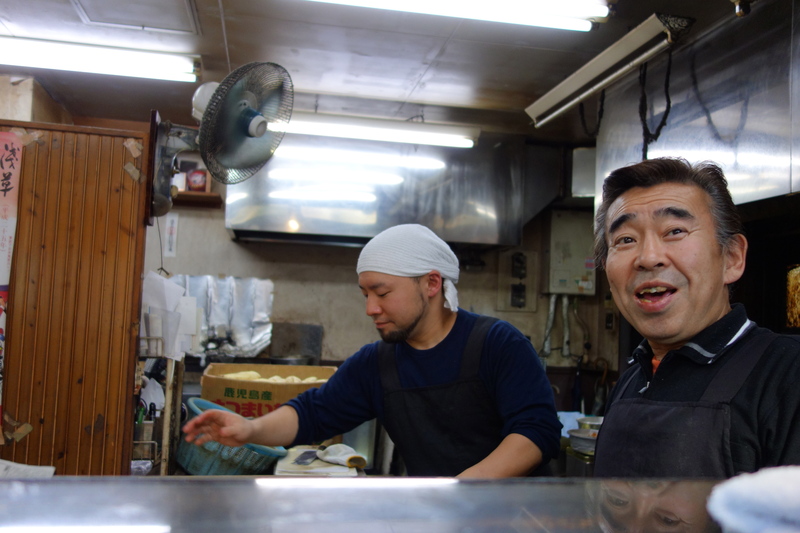 Chiba-ya has been here since 1950, says 60-year-old master Noboru Masuda. His brother weighs out the potatoes and his son handles the deep frying. He will be the third-generation boss since his grandfather, who passed away two years ago. 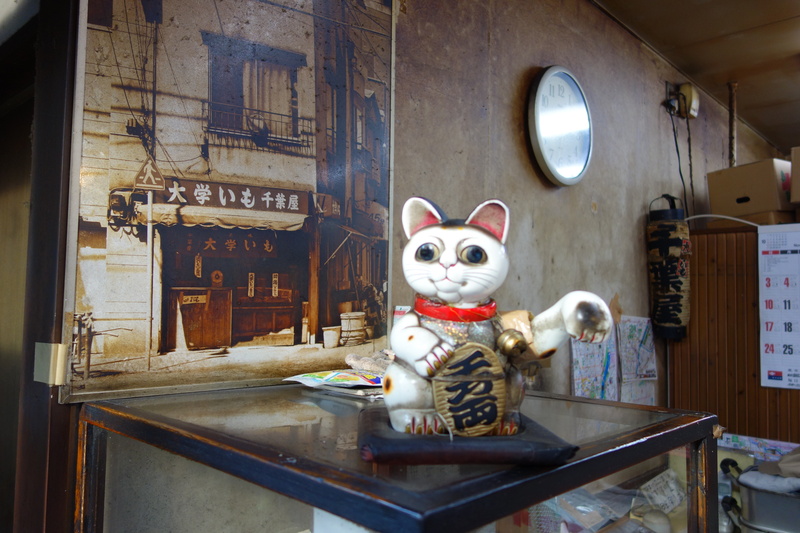 The modern apartment block they work from went up in 1995, the original building is in the picture on the counter, behind the customer-beckoning cat. The cat seems to pay off, unlike some cats, for Masuda says sales are better than when he was a kid, obviously better than at many stores around here. Quality junk food never goes out of style.